The Warriors and Cavs battled in the first two games of the NBA Finals, both having success with certain offensive and defensive schemes. 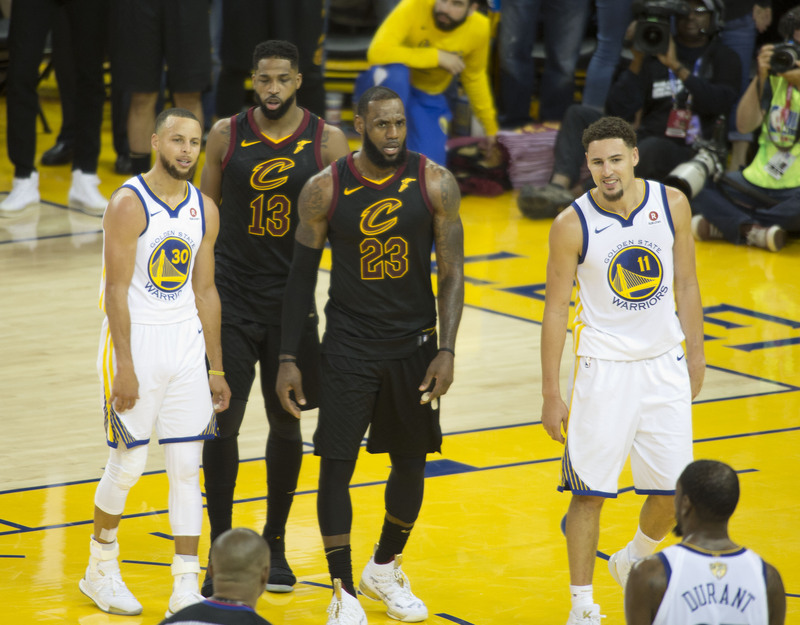 The 2018 NBA Finals has resembled a boxing match, with both teams punching and counter-punching each other (with plays, not fists, although that almost happened). In Game 1, we witnessed one of the greatest individual performances in recent memory as LeBron James nearly carried the Cavaliers to a road upset in Oakland. In Game 2, Stephen Curry, Klay Thompson and Kevin Durant showcased the offensive firepower that the Golden State can unleash on any given night. Game 3 in Cleveland is a critical game for both teams. The Cavs have a shot to claw back into series contention on their home court, while the Warriors have a chance to put a dagger into any hope of a Cleveland comeback by taking a 3-0 lead. This post will highlight areas where each team has succeeded thus far, as well as point out what we can expect to see from them heading into Game 3 Wednesday night. Cleveland has done a fairly well job at limiting the early offense and movement of Golden State, but when the Warriors have had early opportunities, they have made them count. After Game 1 was played at a slow pace (92.59) – the second-slowest game for the Warriors this postseason – Game 2’s pace increase to 96.34. Look for Golden State to utilize drag screens, pin downs and player movement in early offense in Game 3. Drag Open is an early offense action that Golden State utilizes to get Curry and Durant in ball screens while Klay Thompson does what he does best, which is running off screens for catch and shoot looks. Through 2 games, Golden State has had 24 ATO situations. The Warriors have scored on 11 of those possessions. Throughout the season, the Warriors were one of the most efficient teams out of ATO sets. As a team, GSW scores .995 ppp (Points Per Possession) out of ATO situations, shooting 47.9% and scoring at least 1 point 43.7% of the time. These numbers translate to a Top 5 ranking in ATO situations. Curry, Durant and Thompson can occupy any of the perimeter spots. Durant can also shift to play the 4. Green can occupy 3-5. Stagger Option is a favorite ATO of the Warriors. This set is designed to get elite scorers doing what they do best, moving without the ball. This set creates catch and shoot, and pin/slip opportunities, and if teams fall asleep guarding the ball, GSW will take advantage of a sneak drive. The Cavs have put Curry into the pick and roll as the screener defender 26 times per game in the Finals. On James/George Hill ball screens with Curry defending Hill (14 times, 17% of all James ball screens in the Finals), the Cavaliers average 1.43 points per possession. By forcing Curry into this position, he is forced to switch onto James which is a scenario Golden State would like to avoid. Curry tries to hedge and switch back late, which leads to Cleveland scoring easily. Cleveland uses its Thumb Down MPR offense to force Curry into these ball screen situations. In Game 3, look for Cleveland to continue attacking Curry in ball screens as the screener defender more often than the on-ball defender. If Cleveland is going to have a shot at winning, Love is going to have to put his stamp on the game. James needs a secondary option to take some of the offensive load off his shoulders. Through the first 2 games, Love has shown the ability to score when he gets his number called. Cleveland likes to run a Corner Action for Love, as it gives him the opportunity to move and play off James. Easy scoring opportunities are the best way to get a player’s confidence going. The Corner Elbow Big set gives Love perimeter and post scoring opportunities. So, here we are with a 2-0 lead for Golden State in the NBA Finals after holding serve on its home court. Now its Cleveland’s turn to take care of business at home, where it has only lost one game this postseason. Look for each squad to utilize sets that worked in Games 1 and 2, while making adjustments in areas it got burned on. Continuing with the boxing analogy, Cleveland is on the ropes but still has a chance if it can execute its game plan while blocking Golden State’s punches in the process. Austin Anderson has a versatile background in basketball at the collegiate and professional levels. He recently completed an internship with the Charlotte Hornets as a video scout intern where he assisted the video coordinators with opponent scouting and game planning. Anderson was also responsible for opponent personnel edits, databasing free agents, and building a video playbook, along with player development workouts and team practices. Follow him on Twitter @Coach_Aust1nKA.